ESRI CityEngine, Lumion, and SketchUp – The Ultimate City Toolkit? 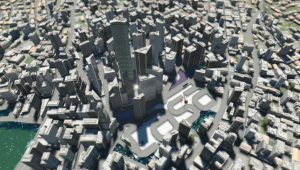 e heart of the CityEngine is the ability to import real world data but to get to grips with the interface it is sometimes easier to look at creating urban scenes from simple procedural rules. The Urban Engine is all about getting down to street level user experience – cars, bikes and people – because that is where we live. Feel free to contact us via http://www.u-c.com.au to have a go any time. We will send you a link. We love City Engine, SketchUp and Max too – and it all fits into the same workflow. However, we tend to take real data from GIS / LIDAR / survey / CAD design and push that through as a context (via FBX) then start importing revitt / max / sketchup proposals into this base. This is what the Victorian Government now use on a daily basis in house for development assessment. We have also built a “2.5D” building volumetric tool to allow real simple forms to be made in about 12 seconds (easier than sketchup) – to be used live in meetings. the 3-way marriage between Lumion, Cityengine and Sketchup (or other 3d modelling software)is a powerful one. I think it benefits from the same things: the ease and speed to create beautiful things. A pity there aren’t many cga rulefiles available to use, I see you’re still using the 2010 standard template as are many people. The emphasis is too much on possibilities of the program and integration with other software instead of creating real usable content. Creating a rulefile yourself is imo still too hard.